MFA in Visual Studies visiting artist and musician Guillermo E. Brown talks with Tim DuRoche about working across boundaries of music and art. Visiting artist and Caldera Laboratories resident Guillermo E. Brown talks to Portland-based artist, writer and jazz musician-composer Tim DuRoche about working across boundaries. Brown speaks about his roots in New Haven, where he developed his interest in free jazz at a young age with musicians including Anthony Braxton and Dwight Andrews. He also talks about recent projects, performing with the David S. Ware Trio, teaching at NYU, and plays excerpts of his work, including some of his newest work created on the road while on a six-month tour. Guillermo E. Brown is a musician, multidisciplinary performer and producer/composer. 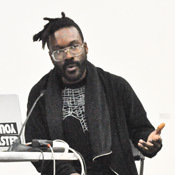 He was awarded a 2001 Artist-in-Residence and 2003 Van Lier Fellowship from Harvestworks Digital Media Arts Center. Featured on over 25 recordings, he has performed or recorded with David S. Ware, Anti-Pop Consortium, Anthony Braxton, DJ Spooky, El P, Carl Hancock Rux, Vernon Reid/DJ Logic’s Yohimbe Brothers, Mike Ladd, George Lewis, Vijay Iyer and Gordon Voidwell among others. PNCA Caldera Laboratories is a collaborative effort between Caldera Artist Residency and Pacific Northwest College of Art, joining forces to construct a site of possibility. Visiting artists, scholars, curators and critics come together with PNCA faculty and MFA students in a laboratory setting engaging in art making, original research, and visual and written investigations. Listen to a live improv set with Guillermo E. Brown and Tim DuRoche at Design Within Reach Portland Studios.